George Mira, Sr. will long be remembered by Hurricane fans as one of Miami's greatest quarterbacks and perhaps the 'Canes greatest player ever. In his three year career, Mira set numerous passing records, some of which are still in the record books. During his career, Miami once again gained national prominence, reaching the 1961 Liberty Bowl, the first bowl appearance in 19 years. Mira was the quarterback and passer for the '60's, he could drop back and pass and scramble when he had to, which earned him his nickname "The Matador". In 1962 Mira lead the Hurricanes to the Gotham Bowl in New York City and proved to the country that he was the real deal. At the time of his Hall of Fame induction, Mira still lead UM in total offense, 5,125 yards, which is still in the top ten for that category. When his UM career was completed his jersey, No. 10, was retired, an honor that was given to only one player before him. After his college career Mira signed with the San Francisco 49'ers. 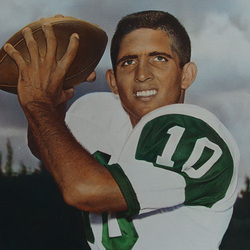 George Mira is considered the founding quarterback of "Quarterback U".